The auditor general says Ontario Liberals are downplaying their deficits by billions. Ontario Liberal Leader Kathleen Wynne makes a policy announcement at the Finishing Trades Institute of Ontario in Toronto on May 14, 2018. Ontario Liberals say there's nothing hypocritical about raising alarms over what they call a multi-billion dollar error in the NDP platform just weeks after the province's auditor general accused them of downplaying their deficit projections by billions. Liberal Leader Kathleen Wynne and Mississauga candidate Charles Sousa, who has served as her finance minister, targeted Andrea Horwath's NDP at a press conference in Toronto Monday. Opinion polls suggest the NDP is competing with the Liberals for second place as Doug Ford's Progressive Conservatives remain in the lead. The Liberals say there is a $3-billion miscalculation at the heart of Horwath's platform because New Democrats did not factor in Liberal spending announced between last year's budget and this year's spending plan. Horwath stands by her numbers. Sousa charged that the discrepancy raises questions about the NDP's "competence." Wynne said while it was probably an honest mistake, the plans put forward by each party deserve "the same degree of scrutiny." But a reporter questioned if Liberals have any credibility on the issue in light of a report released by Ontario Auditor General Bonnie Lysyk late last month. Lysyk accused the Liberal government of "dramatically" understating the size of the province's deficits. The $6.7 billion shortfall projected by the Liberals for 2018-2019 will instead be $11.7 billion, she said in her report. And the Liberals' projected deficit of $6.5 billion in 2020-2021 will actually be $12.5 billion, according to the auditor. Wynne said at the time the issue was part of an ongoing "accounting dispute" between her government and the watchdog. She delivered a similar message Monday. "Our books have been scrutinized and re-scrutinized and yes, there's an accounting dispute about the treatment of some of the numbers but the reality is that no one — neither the FAO (financial accountability office), neither the auditor general — has said that what we've said we can do, we can't," Wynne said. "That has never been the case." Sousa said the auditor general and FAO have taken stock of what the government has pledged it will do and has already done. "What the NDP have done is they've removed a whole year of programs, and they've put it in their narrative but they haven't accounted for it," Sousa said before claiming the NDP will put Ontario's economy and people at risk. Wynne shook her head as the reporter asked if it will come across as the same headline to voters: both Liberals and the NDP are accused of being off in their math by billions. "Everything that we have in our plan we have made explicit how it is going to be paid for," Wynne responded. The NDP released a statement saying the platform will not, as Liberals charge, defund billions in funding to programs. 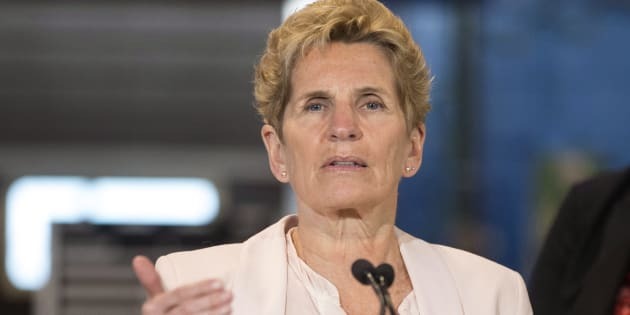 The party also noted that, "on the other hand," Ontario's auditor general concluded the Wynne government's pre-election report was not a "reasonable presentation of Ontario's finances." "Wynne's pathetic attempt to discredit the NDP only reminds Ontarians how badly they've been let down by her," the party said in a statement. Ford has said he will bring in an outside auditor to look at the province's finances if Tories win government. The former Toronto city councillor has repeatedly accused Wynne Liberals of "cooking the books." Ford has not released a fully costed platform, but has pledged do so before next month's vote. Ontario Liberal Leader Kathleen Wynne, centre, Progressive Conservative Leader Doug Ford, left, and NDP Leader Andrea Horwath take part in the Ontario Leaders debate in Toronto on May 7, 2018. Instead, Ford is unveiling aspects of his platform with estimated price tags. His pledge to bring in a tax cut for the middle class by the end of the third year of a Tory government, for example, is expected to cost $2.3 billion. The Tory leader has faced pressure from both Wynne and Horwath to reveal details on how he intends to pay for his promises and where, specifically, he might make cuts. Ford says he'll find "efficiencies" in government, but denies that means cuts to health care or education, as his rivals claim. Ontario voters head to the polls on June 7.